The Huntington Zoning Board of Appeals was forced to adjourn a public hearing Thursday night on developers’ plans to construct a four-story, 84-unit luxury apartment building in Huntington village because there were too many people. Hundreds of Huntington residents converged on town hall for the hearing on a proposed 271,000-square-foot building that would require the demolition and re-construction of five lots fronting Main Street, Gerard Street and Stewart Avenue. Huntington-based attorney Jim Margolin, who is representing the project’s developer John Kean and property owner Alan Fromkin, began the hearing with an in-depth presentation on the proposed development. After about 45 minutes Posillico told the audience the hearing would have to be postponed because the lone speaker for those listening in the hallway had stopped working. In an interview Monday, Kean said the proposed mix-used building would include retail and restaurant space in addition to the apartments. Plans also call for a 127-space, below-grade parking garage on the Gerard Street side of the development. Bob Suter, a member of the group, said members of Save Huntington Village also handed out around 170 signs at an event on Jan. 19. Kean said the properties currently carry a 392-space parking variance from the ZBA, and the decreased retail and restaurant space in the proposed building would actually improve the parking situation. 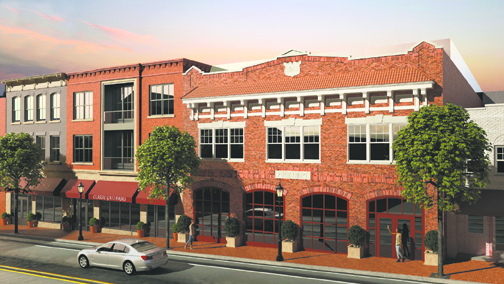 A rendering of the Main Street facade as proposed replicates the look and feel of its original use as a firehouse. In addition, Kean said the proposed building would not exceed the 45-foot height limit mandated under town code. The project is considered four stories because town code counts a parking garage as a floor, even though parking garage will function like a walkout basement along Gerard Street, according to Kean. The ZBA voted unanimously to adjourn the meeting. Posillico said the meeting would be rescheduled at “an appropriate venue” as soon as possible.